Think for a moment about the various assets and products located throughout your hospital, clinic or resident care center: the pharmaceuticals, for instance, or the vaccines, or even the perishable food items. As far as your institution is concerned, do you know which of those products has the most financial value? Would it be damaging to your facility if the test results in its labs were ruined as a result of poor temperature tracking? Or would it be worse if your facility’s data centers had to be replaced because of an unnoticed air-conditioning failure in the network closet? No matter what sort of care facility you manage, hopefully none of those scenarios represent anything you’ll ever have to worry about. Nevertheless—and please do forgive the cliché—it’s almost always preferable to be safe rather than sorry in the health care industry. That’s why CenTrak developed a clinical-grade visibility solution that easily monitors any items that require strict temperature-controlled conditions. It’s known as the Smarter Sensor, and aside from being able to communicate with your existing Wi-Fi network or CenTrak’s proprietary radio frequency (RF) network, the Smarter Sensor is capable of monitoring an incredible broad range of temperatures, from -200° C (-328° F) to 75° C (167° F). You’ll be meeting compliance standards and preventing product loss at the same time with CenTrak’s clinical-grade Smarter Sensor, which comes with the added advantage of recording and tracking data remotely. The need for manual reporting, in other words, is completely eliminated once the Sensor is installed. Customizable and automated reports, which can be pulled for literally any time period, are generated in just a few seconds. Which Applications Can the Smarter Sensor Monitor? If your hospital or facility has perishable or temperature-sensitive items onsite—and of course it does—the truth is that the Smarter Sensor can almost certainly track and monitor all of them. As we briefly discussed earlier in the article, the sensor is capable of ensuring that all pharmacy products and medications are maintained and produced under recommended storage conditions, and that vaccines are maintained under conditions that are recommended by the Centers for Disease Control (CDC). • Does your facility have an onsite blood bank? CenTrak’s Sensor can be used to make sure precise temperature and humidity conditions are maintained wherever blood is stored, and that the temperature meets AABB standards. • Because of the Smarter Senor’s small footprint and its simple plug-and-play installation, it can easily be used to monitor and track in-transit healthcare materials such blood, transplant tissues and organs. • Not only can the Sensor be used to achieve food safety and maintain shelf life for perishable food items in your kitchens or cafeterias. It can also monitor dishwater rinse temperature to HACCP standards. • The monitoring of hospital equipment can be automated around the clock, 24/7, with the Smarter Sensor. If you’re located in a region of the country where humidity or extreme temperatures can have a negative effect on expensive hospital equipment, the sensor’s monitoring capabilities alone have the potential of saving your facility many thousands of dollars. Make no mistake: Regardless of what CenTrak’s Sensor is capable of, this is one decidedly low-maintenance device. It boasts an extremely long battery life, it requires no wiring, and it only needs to be calibrated every two years. What’s more, it’s surprisingly low all-in cost will help tremendously where rapid ROI is concerned. 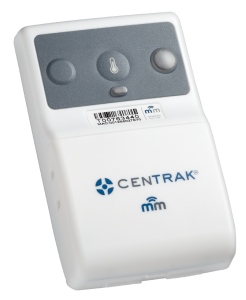 To learn more about the Smarter Sensor, please visit our website at www.centrak.com, email us at sales@centrack.com or call us toll-free at 800-515-2928.